webfork wrote: I got confused by this so -- to clarify -- chkunin is a component of Primo (as mentioned earlier in the thread, it's used to check for left-over registy entries and files/folders if you un-install a system). As a result the whole program has seen an update. Midas wrote: Primo has been updated 2015-09-20: "Version 7.0.2 of Chkunin and version 2.0.0 of Regshot 32-bit and 64-bit is available." Last edited by Midas on Mon May 29, 2017 2:17 am, edited 1 time in total. I have been forever using Primo for my portability testing and it has served me well over the years. Nonetheless, there a few gripes I have that I want to register here as a (very small) way to give back to a long lineage of different contributors that made this tool possible (see above), of which Primo's developer is but the latest (and undoubtedly the most persistent). Let me start by stating what works and why. - Primo (RegShot) is fast! I have yet to meet another tool that matches up to it in sheer speed and that's the main reason I am holding on to it -- as well as the most likely reason for dumping the different alternatives I tested over the years. - Primo (RegShot) is simple! A close second in its appeal. You create the initial snapshot, run the program on test, fiddle with it, close it and run Primo's differential snapshot, feed the report to ChkUnin and (provided you have moderate knowledge of what you're looking at) you get a comprehensive overview of the program's interaction with your system, as well as a quick path to reverse any changes made. Now before I get started on the niggles, let's have some pictures to make all of this crystal clear. And now for a straight list of aspects that are ready candidates for improvement, IMHO. Finally, this post is just a preliminary run-up of my findings -- I intend to add a few more over coming days, as well as inform Randy (the dev) about them. Feel free to chime in if so inclined. Haven't checked what's in the update, so you might be lucky on some of your 'niggles'. Or maybe not! 'Regshot history.txt' author wrote: Version 1.9.1, 2.1.0, Jan 21, 2017. (1) I actually review & edit every output file so readability is an issue for me. I spend a lot time turning wordwrap on & off to make sense of the regkey sections. amount of line space - in many cases eliminating the need for word wrap. (2) When the program is done it calls notepad to display the file. Many of your users have long ago moved to something more capable than notepad. Why not just call the default text editor? 2 - I modified Regshot to use HKCU rather than HKEY_USERS\sid\ if you tell it to. HKCU\ in the output file. 3 - There is a new check box in Regshot that allows you to change this. in the [Setup] section, add Flag4=0. Also, to shorten other registry names, change UseLongRegHead=1 to UseLongRegHead=0. First off, thanks for all the suggestions and for using Primo. I am surprised to see it in https://www.portablefreeware.com! I guess it is more useful than I thought it would be. It was originally written just for me, so I'm happy other people think it is useful. 1: You must do a lot more installs than most people! If you have a default, how would you change it? 2: Until I added code to be able to abort Regshot, you had to wait until it was finished. I have looked at defaulting the cursor to the file name box, but no luck so far. If you don't supply a name, one will be generated, but that is not ideal either. would probably be irksome too. 3: Yes, I think my version number in the "About" is off by one. 4: If I didn't tell you when the 1st shot was done, would that be better? 6: The C&ompare dialog was added to Regshot 1.9.1 by it's developers, and I just never removed it. I figured the more information you have, the better. before you uninstalled a program, it would generate a lot of error messages. programmers than I am. They are why Regshot is so fast. But... it is old... from Feb 2012. It has not been updated and is only 32-bit. rhinbc wrote: ↑ First off, thanks for all the suggestions and for using Primo. Hi and welcome to TPFC. As you can see, this is a community devoted to free software that is (or can be made) portable. Cumulatively, most members expect portable software to also be "stealth" -- and for an explanation of what such terms mean locally, please check here and here. rhinbc wrote: ↑ 1: You must do a lot more installs than most people! If you have a default, how would you change it? It works similar to File Explorer right-click. It shows what options there are, and then you select one of them. As a long time member of TPFC, that is in fact true. Members are encouraged to test software before submitting it to the community's appraisal and provide as much info on system modifications as possible. I understand how the menu system works, it's just the defaults are less than ideal for my continued and recurring use. rhinbc wrote: ↑ 2: Until I added code to be able to abort Regshot, you had to wait until it was finished. I have looked at defaulting the cursor to the file name box, but no luck so far. If you don't supply a name, one will be generated, but that is not ideal either. IF I check to see if there is a name, and there isn't, that would add another option that would probably be irksome too. I have no pickle with an auto generated name, it's just that for celerity's sake I tend to have the initial snapshoting running before I even think of giving it a name. As it is, I either first set a name into the corresponding field or I have to wait for the procedure to finish before I can do it. I this age of multi-threading this doesn't make a lot of sense, at least to me. YMMV, though. rhinbc wrote: ↑ 4: If I didn't tell you when the 1st shot was done, would that be better? Instead of a modal dialog to be clicked on before proceeding, an indication could be shown somewhere in Primo's UI, for example. rhinbc wrote: ↑ 5: Why would you send it straight to Chkunin? 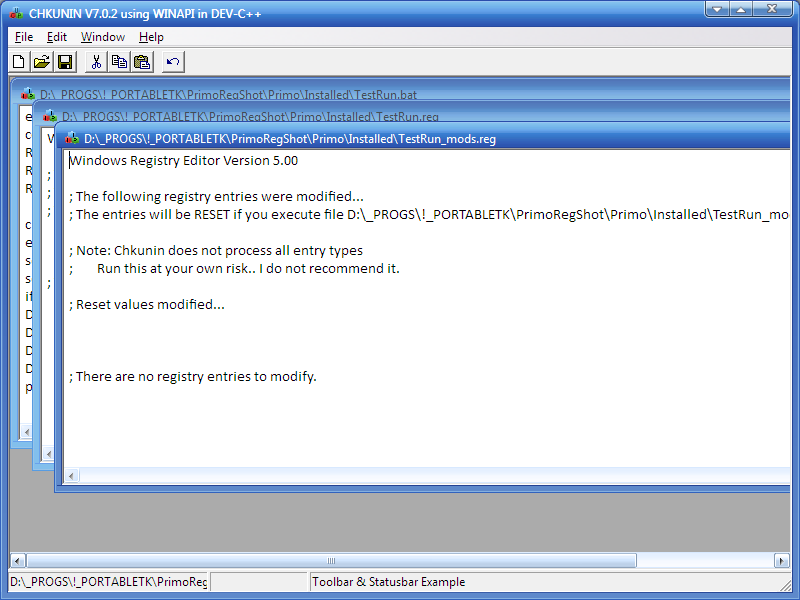 Chkunin is meant to be run AFTER you have uninstalled a program. That way, it shows any files, etc. that were not deleted by the uninstall. I get that is the expected regular use case, but I don't think it fully applies to most portability testing. To clarify: the focus here isn't in an uninstallation utility (there are plenty alternatives in our database, I personally favor GeekUninstaller), is in a fast system changes monitor. Sometimes, I run Primo and Chkunin in sequence multiple times, as when I want to make sure a portabilized program isn't leaking any traceable changes to the system. Right now, I do this through a batch file that invokes Chkunin whenever I close Primo but I'm sure you'll agree it would be preferable to have an option to make this happen automatically (I still have to open the output log file manually). rhinbc wrote: ↑ 6: The C&ompare dialog was added to Regshot 1.9.1 by it's developers, and I just never removed it. I figured the more information you have, the better. And I agree 100%. It just all the clicking gets to be really cumbersome in intensive use situations, so automatic display should be made optional. For my particular purposes, there aren't any significant hurdles for its use, apart from usability ones I mentioned here. rhinbc wrote: ↑ 8: I will look at cleaning up some of this, but in some cases it may mean a rewrite that I am not prepared to do, especially to Regshot. The people who wrote it are way better C++ programmers than I am. They are why Regshot is so fast. Fair enough. These are just my layman suggestions, nothing binding about them. When we (left) click on "1st shot" we're presented with what is really a context menu which, normally, is a right click function. But surppose that Primo were changed so that if you Right clicked on "1st shot" (and "2nd shot and also "Compare) you would be presented with the current context menu but when you made a choice the program would save your selection to the Regshot.ini as your Default Selection. So the next time you ran the program you'd just left click normally on the button, bypassing the context menu entirely, and the program would carry out your saved default action. And any time you want to use a less common method you'd just right click to (naturally) call the context menu where you could change your previous default to something else. For example I ALWAYS use "Shot", "Shot", & "Compare & Output" so this one change would save me 3 clicks on every single install monitor and it doesn't require any new checkmarks on the window or user mods to the ini. And this is extra 3 clicks that ver 2.2 doesn't address. But, wait, there's more. If you were to add a new entry to the context menu for the "Compare" button that said "Compare, Output & Close" then that saves me a 4th click because I don't have to wait to close the program when my attention is on the text file it produced. And the last 2 saved clicks go like this: The "Before Image is Done" window just needs to lose the "OK" button and and not block the "2nd Shot" button. I could just sit there, minding it's own business - not blocking anything else and be dismissed by hitting the "2nd Shot" button. And same for the C&ompare" window. Closing the program dismisses the window. There go clicks #5 & #6. And since i'm already up here on my soapbox I have one more request (that doesn't have to do with clicks - since they're all gone): When Primo starts up it naturally positions itself in the middle of the window. Which means that it's covering up the version info of the install file i'm about to run. The info I need to generate a name for the file I want Primo to save for me. So I drag it off to the side so I can see and then the next time that Primo starts it does it all over again. How about if you asked Primo to remember the window coordinates where it was when it closed last time? Jeez, you guys don't want much, do ya! What are you trying to do, make me learn something new? That's quite a suggestion list, kosmo. And yes, Midas had some of the same suggestions. It looks like some of you use Primo a lot more than I do. some of them... but it may take a while. Thanks for all the suggestions! Thanks for your consideration, rhinbc. And Tom, without dwelling on each one's implications, let me say that I really like your suggestions. Note: apart from a little tidying, the main purpose of this arrangement is to be able to carry it around on a pendrive and have the appropriate bitness version launched automatically. Primo v3.0.1 released, dated 2018-04-22. 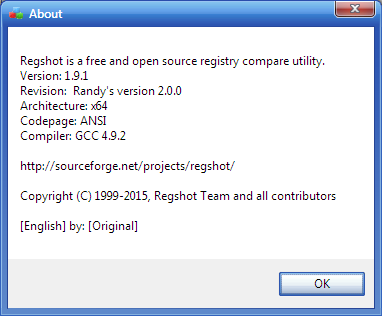 At the request of several (power) users, I have made the following changes to Regshot to create Regshot 3.0.0. 1 – Regshot will now remember its position on the screen, so when you start it again, it should start in the position it was in when you closed it. 2 – A new checkbox has been added to let you set default actions for “1st Shot”, “2nd Shot” and “Compare”. This checkbox is not saved in “regshot.ini” and is turned off after the defaults are set. 3 – A new checkbox has been added to let you use the default actions for “1st Shot”, “2nd Shot” and “Compare”. NOTE: The “Compare” default option will be done automatically after the “2nd Shot” is done. 4 – There is a new “Compare” option: “Compare Output Quit”. When you select this option, after the output file is opened, Regshot automatically closes. 5 – To do the above, several new options have been added to “regshot.ini”. A new flag – “Flag7” – is used to say use the default actions. A new section to store the window position on the screen, and the default actions. This is in “[section1]”. The defaults are: “Shot”, “Shot” and “Compare and Output”. Note that you could edit “regshot.ini” and change the defaults manually. Do not edit the “WinPos” option. 6 - If you do a “Clear” after an install, the counters at the bottom of the dialog will be cleared. My version 3.0.1 of Regshot 1.9.1, April 22, 2018. 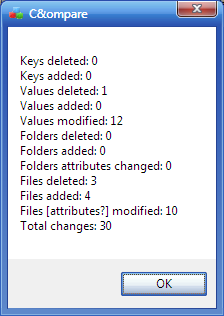 I discovered that if the Compare filename was longer than 13 characters, it was not handled properly. "Regarding your last release, the only niggle I can come up with is how ChkUnin locks some files/folders after analysis, making Windows throw errors whenever one tries to rename/move them. No biggie but still annoying." culprit. Most of the time it is the system that is locking the file. Is CHKUNIN still running when you try to rename the file? That may cause it? I am considering putting PRIMO on SOURCEFORGE but haven't got around to it yet. Or does PORTABLEFREEWARE have a place for source code? Lintalist, I guess PRIMO is not DPI ready. I didn't know there was such a thing! 4K monitor. I run my 19" LCD at 1024x768. folder/file list. If anyone else would be interested, let me know. Thanks. And I'm glad PRIMO is useful to more than just me! 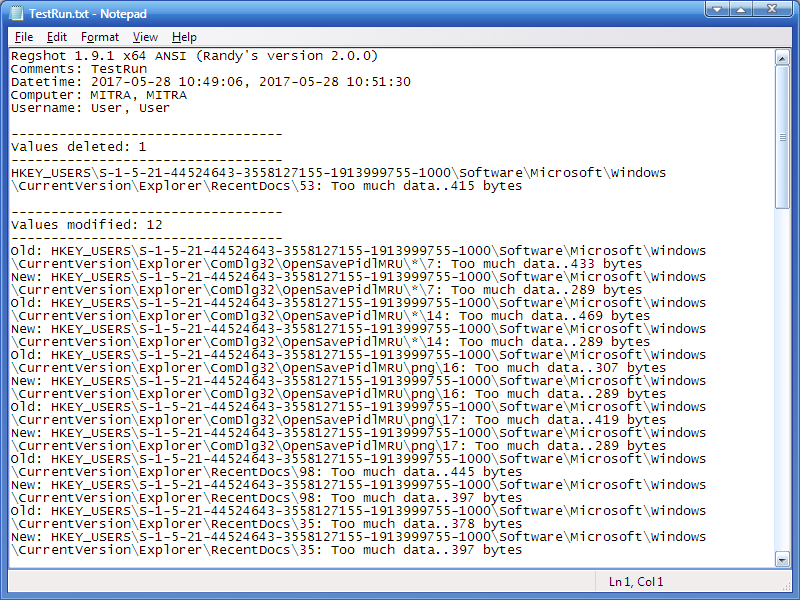 rhinbc wrote: ↑ Is CHKUNIN still running when you try to rename the file? That may cause it? Hi and thanks for chiming in. Interesting.... I'll have to look in to that and hopefully see why CHKUNIN locks files.